India was a magical week for us at www.OneMileRunner.com. Seeing old friends, meeting new friends, and giving two speaking presentations, we were busy from start to finish. It was a pleasure to see the boom of Chennai. Construction, business, and development is seen throughout the city. It has changed so much since my days when I lived in Chennai (Madras then) from 1986-91, before the days of the internet, cell phones, and email. I remember it took me two years to get a land line phone in my apartment. Now cell phones connect the country and IT businesses are all over the lands of India. Our hosts for the week, Savera Hotel, www.saverahotel.com, and O2 Health Studio, www.o2healthstudio.com, both directed by Nina Reddy made our stay for our Asian Race very special. My race took place along Bay of Bengal as it is the second longest beach line in the world. 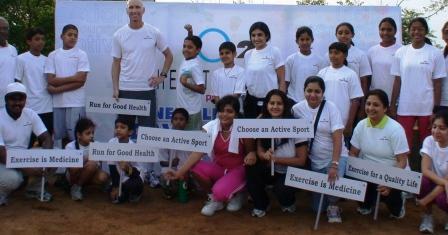 I used to run with my tennis proteges in the deep sands of Marina beach in Chennai. After running up and down the beach for 4.5 years, I was suddenly chased by a crazy bull a few months before I was to leave for the USA. Luckily, I barely got away. The location of this run did bring back memories of me screaming at the top of my lungs back in 1991. This race in 2010, I escaped without disturbing any animals and actually felt in the best race form during our tour of Around The World In Less Than 30 Minutes. This is actually the best I can race on a flat, straight course recording 4:35.75 for race #5. Sekyen and I are currently in Singapore on our way to Brisbane, Australia tomorrow afternoon. Then we fly to Townsville on the 4th of August as we prepare for our final leg of our around the world event. I race on Sunday, August 8th. I had the great fortune of running tonight with Christy Guna Desa, the friendly concierge manager at the Singapore Marriott Hotel where we are staying. Christy is into marathon running and triathlons and I appreciate his Singaporean hospitality showing me around this wonderful city. Singapore is soon to be hosting the first ever Youth Olympics from August 12-26th. I am sure that the city of Singapore will do a fantastic job in hosting the youths of the world. Posted in - My Daily Journal 2010, Author - David O'Meara.